This is the same contractor who built the village school visited by Cam and Sam in November. Now we need to get on and raise some more money! We need another $30,000 AUD to complete Stage 1. On 5 August Samuel was invited by the Chancellor of Victoria University, Mr George Pappas, to address a dinner of the Chancellor’s Centenary Circle. 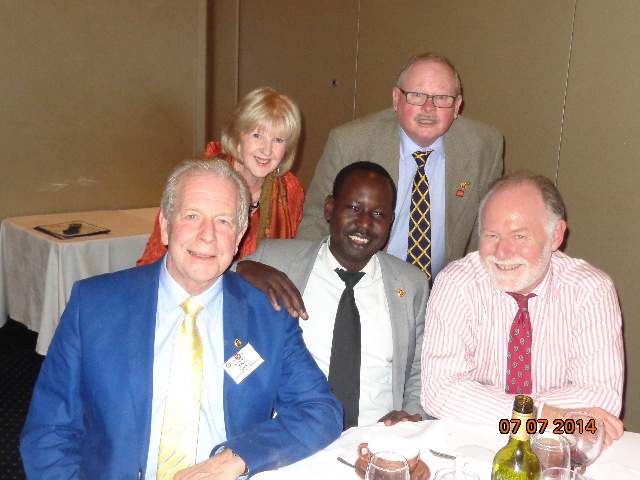 Sam spoke to the gathering of his life as a Lost Boy of South Sudan, his dream of building a primary school in Rumbek and of the great support provided to him by Victoria University throughout his education. “Coming to Australia, I now had to learn English properly. It is my fourth language. Dinka is my mother tongue; then Arabic; and then Swahili learnt in Kenya. “And of course I had little formal education when I arrived. Education was the greatest gift given to me by my new country, Australia. But I had a lot of catching up to do. It was NMIT who provided the building blocks that helped me gain entrance to university. From there it was Victoria University that equipped me with the practical learning necessary to start a new life. VU provided opportunities to educate myself, which in turn led to a professional job and a better life. “I was first attracted to VU because of its reputation for valuing cultural diversity and its commitment to excellence and innovation. I have seen that these are not just words but values exemplified by the staff in their daily work. Their help supported & motivated me, providing me with the tools I needed for my personal & professional development. VU also generously provided financial assistance through a scholarship. Sam went on to say that the educational values absorbed during his time at VU had helped provide the inspiration for the Melbourne Rumbek Primary School project. We are thrilled to announce that Ajak Kwai will perform at our 11 October Fundraiser Dinner. Ajak Kwai & Friends are the latest addition to a night that promises to showcase some wonderful South Sudanese entertainment. Ajak is a singer/songwriter of rare talent who now calls Melbourne home. Come and listen to her rich & haunting melodies as we raise funds to build a primary school in Rumbek, South Sudan. Announcing our new logo designed by Miles Scott Kimber in Provence, France. 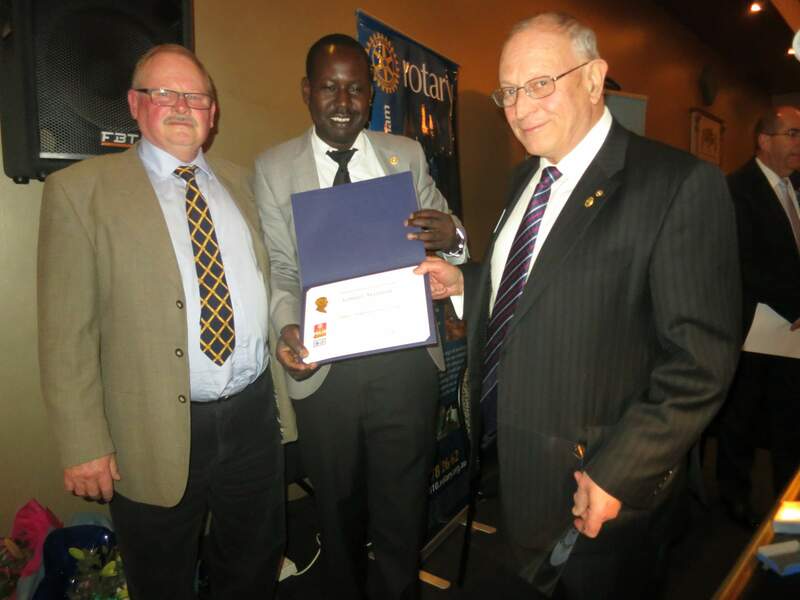 On 7 July 2014 Sam and Joady were honoured as Paul Harris Fellows by Rotary Club of Manningham. This award recognised their contributions to the community especially work on the Melbourne Rumbek Primary School project. Well done guys! After Sam’s March talk to Warrandyte Rotary Club we were delighted to receive a donation of $1000 supporting the project. Thanks very much guys! Your generosity is overwhelming. Sam and Joady Barnes received a warm response from RC Dandenong on 31 March. RC Dandenong generously donated a cheque for $500 towards the South Sudan School project! Cameron Hagger and Sam Manhom have been busy meeting with various education institutions. They recently visited Wesley College, where they were received positively and will address the school regarding supporting our project in the third term. Cameron and Sam also visited VUT and spoke with Colin Clarke, Dean of the School of Business, regarding student support. He referred them to VU ENACTUS to see if this could become one of the students supported charities. ENACTUS is now getting involved in the project!